Leptosiphon aureus (Nutt.) Benth. ex E. Vilm. Habit: Annual. Stem: thread-like, glabrous or hairy, glandular or not. Leaf: lobes 3--6 mm, linear. Inflorescence: flower 1; peduncle 5--15 mm, thread-like. Flower: calyx 4--6 mm, membrane wider than lobes; corolla funnel-shaped, tube 3--5 mm, with hairy ring inside and out, lobes 5--7 mm, oblanceolate; filaments glabrous, attached above hairy ring, in throat; stigmas 3--4 mm, exserted. Note: New name possibly needed because Leptosiphon aureus might have been used earlier for different taxon. Following subspecies overlap in geography but do not occur together. 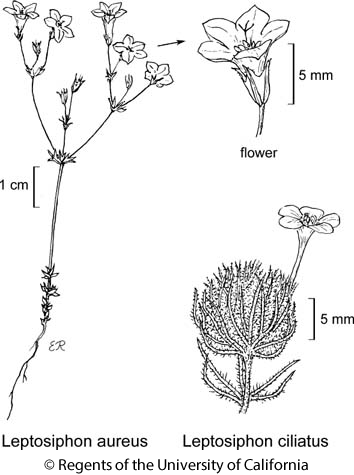 Citation for this treatment: Robert Patterson & Robyn Battaglia 2012, Leptosiphon aureus, in Jepson Flora Project (eds.) Jepson eFlora, http://ucjeps.berkeley.edu/eflora/eflora_display.php?tid=80383, accessed on April 22, 2019.